Up until today, I've only scrapped 12x12 layouts. I decided to go a bit out of my comfort zone. This is my first attempt at an 8.5x11. I can easily say I'm addicted to smaller layouts now! They are so fun, easy, and stress free! 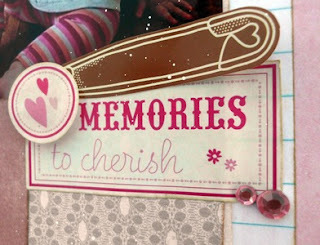 Not to mention, having a variety of different sized layouts in my scrapbook will give it much more interest. The photo is of my baby girl, Charlotte. There are actually quite a few similar photos in my stack of 4x6s. You see, I do not have my own SLR camera (much to my dismay). However, my father does and I borrow it as often as I can. Every time I borrow it - I make it a point to give my daughter a tiny photo shoot. For the most part - she cooperates as well as you can expect a one year old to. With that being said, she really is the perfect model! She seems to love her time in front of the camera and she is great at posing! I'm not sure as to whether she does the posing on purpose or if it just comes naturally to her. 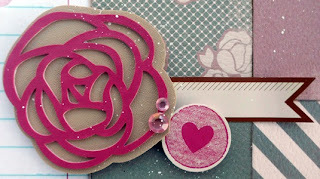 On this particular layout I used Authentique's Free Bird - Blush series for the little squares. I inked the edges of each square with Vintage Photo (along with the edges of the base of the layout and the notebook paper). The card stock I used for the base is from Echo Park's "Happy Days" collection. Nothing seemed to flow along with the card stock base and the little squares until I added the notebook paper. I think that gave the layout such a nice touch! This may not be the last time I use notebook paper on a layout. ;) The embellishments are from various companies. The "Memories to Cherish" sticker and the two similar heart stickers are by Colorbök. The brown pennant sticker, safety pin sticker, other heart sticker, camera sticker, and girl's silhouette sticker are all by Amy Tangerine. The flower is from American Craft's Dear Lizzy Collection. I used bling to add a necklace onto the girl and then added it to the other clutter of embellishments for continuity. I splattered a bit of white paint here and there to tie in the rest of the layout with the white of the notebook paper. 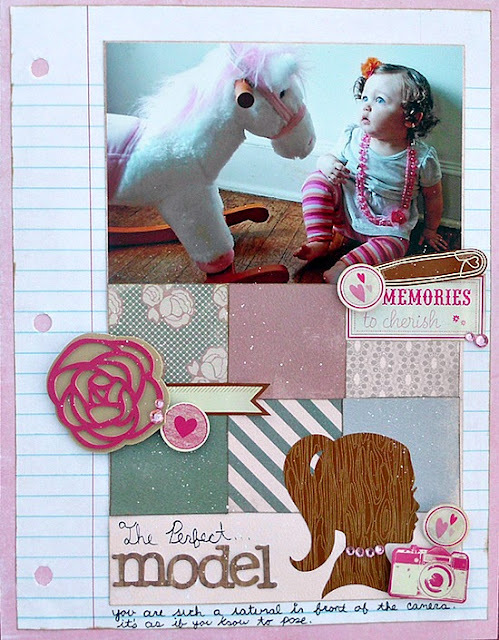 The word "model" is spelled out using cardstock alphas from Crate Paper's Emma's Shoppe Collection. I wrote out the rest of the title and the journaling using my Zig Writer Pen. I really wish we could scrap together... we would have so much fun!!!!! Cute layout...easy to do with such a cute subject!